OTConnections is a social media page sponsored by the American Occupational Therapy Association. The Physical Disabilities Special Interest Section (SIS) moderates a forum on oncology in the member only section. Cancer.gov is the central website for the National Cancer Institute (NCI), the U.S. government’s principal agency for cancer research. The mission of OToncology is to organize and disseminate information relevant to occupational therapy practitioners who provide services for individuals impacted by cancer. The site contributors are all occupational therapy experts in oncology rehabilitation. 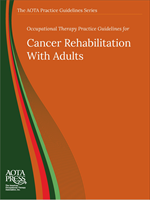 Occupational Therapy Practice Guidelines for Cancer Rehabilitation With Adults (2017). Braveman, B. & Hunter, E. Bethesda Maryland, AOTA Press. Cancer is the second-leading cause of death in the United States. Approximately 40% of people will be diagnosed with some form of the disease in their lifetime; men are at higher risk than women. By 2024, 22 million cancer survivors are expected to be living in the United States. For adult clients with cancer, occupational therapy practitioners provide interventions focused on rehabilitation, helping clients resume occupations and ADLs. This Practice Guideline provides an overview of the evidence for the effectiveness of various occupational therapy interventions for adults with cancer who are undergoing rehabilitation. The occupational therapy process for adults with cancer is described, defining the domain and interventions that occur within acceptable occupational therapy practice. Evidence is presented on occupational therapy interventions with multidisciplinary programs, symptom management, psychosocial needs, physical activity, lymphedema management, CHAIH, PAMs, sexuality, and return to work. Appendixes include selected CPT® codes for occupational therapy, an explanation of evidence-based practice, and evidence tables on a flash drive for ease of use. These guidelines should be useful to the many entities involved in providing occupational therapy services to individuals with cancer, such as occupational therapy practitioners, team members, educators, clients, families, caregivers, third-party payers, and policymakers.